Before being given the chance to do this review I was a reformed FM addict, who’s last regular gig came back in the 2013 version. Across three weeks of near-constant play post-Freshers I got Cambridge United successive promotions from the Conference National into League One. However, after relegation from the third-tier to a controversial penalty call on the last day of my third season in change, I was livid and quit in a fit of rage. I’ve kept a lingering eye on the game since, and now I’ve been lured back by the chance to show you fine people the latest edition. 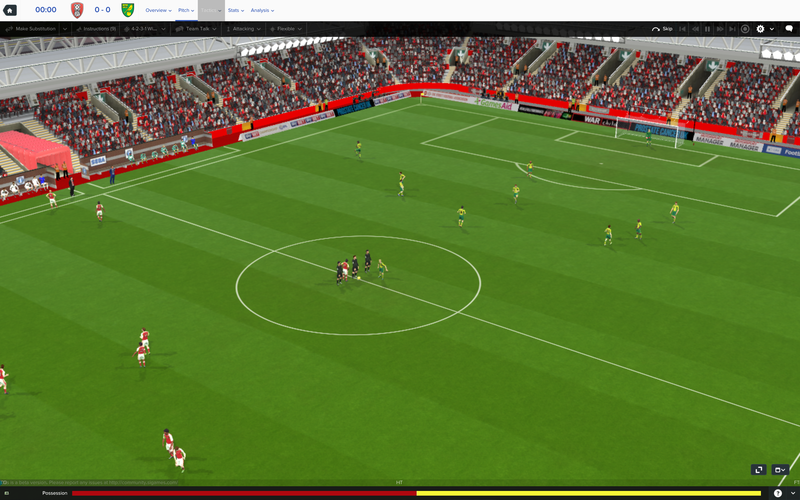 This time I’m playing as Norwich City, seeking an instant return to the Premier League. 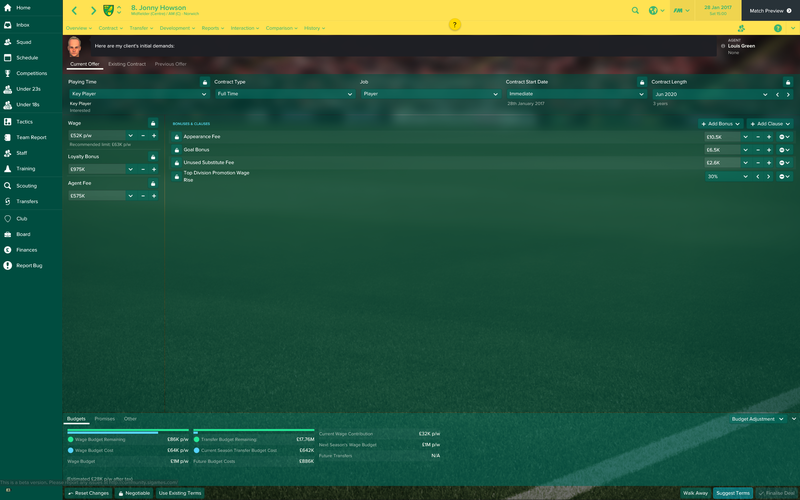 Without further ado, here are five new or significantly updated features in the game that have particularly caught my eye while trying to give the Canaries an instant return to the Premier League. My cheeky grin is implanted onto the game using some rather clever tech. The first noticeably different feature comes before one has even started a new game – the manager itself. 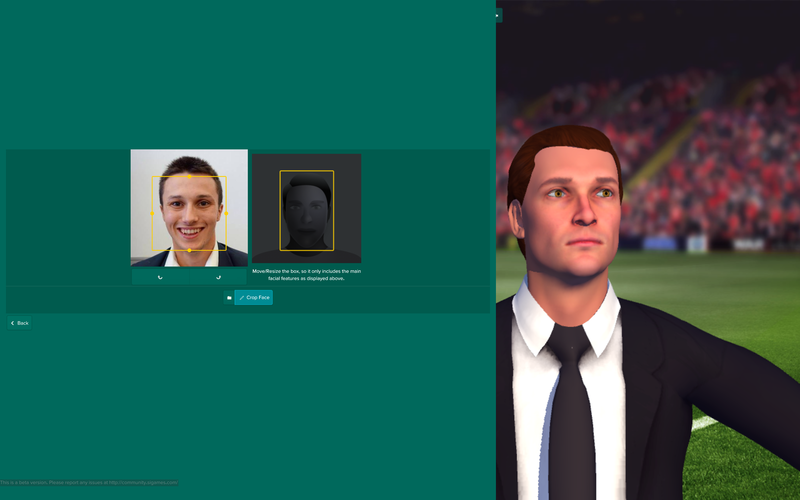 FM2016 saw a manager who prowls the touchline added to the game for the first time, and Sports Interactive have gone a few step furthers in allowing a customised appearance. You can add their face into the game directly from a photo, and as the screenshots above attest to it certainly gives a more distinguished look. It clearly adds to the immersive experience, albeit unfortunately the broad smile in the only photo I had available ensured my look had a slight touch of the Halloween about it! 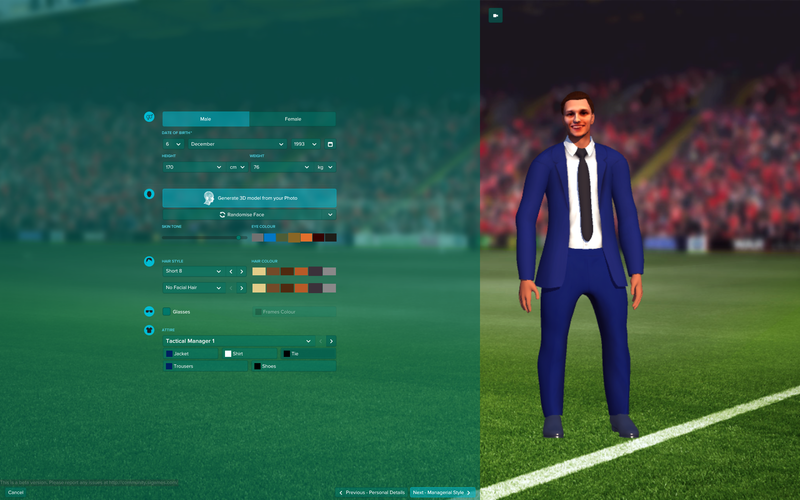 The appearance of the overall manager can also be changed, including weight, height and from suit to tracksuit and everything in between including glasses and even the colour – hence the dark blue suit. Facial hair options are available too for those gaffers that unlike me, want their beards/goatees/moustaches represented appropriately. Unfortunately that facial hair won’t grow and can’t be groomed in the game itself, though maybe that’s one for FM18. Creator Miles Jacobson has said on various occasions that there are thousand’s of ideas in development, so just maybe this is one of them. Overall the improvements with face and general customisation only help to continue to make this much-loved series all the more immersive. The final piece, giving a more than reasonable likeness, front teeth and all. Having a natter: You’re going to be chatting to the board more often that ever this year, whether you like it or not. So, you’ve put yourself firmly in the game by customised your appearance and picked the team you want to take the world glory – whether that be Braintree or Barcelona. The next people you have to speak to are the bosses of your new employers – the board. Managing the board is clearly important to be successful, but that relationship is significantly different on this edition. The primary change, which is quickly obvious, is that the board engage noticeably more often than seen previously across a much wider range of issues. Long gone are the days when they’ll let give you the targets, transfer and wage budgets at the start of the season and largely let you get you get on with it. As soon as you’ve got your feet under the proverbial table, the board will get discussing contract offers, budget options and staff sizes, in a radically widened agenda of what you can discuss with the board. This also includes more advanced discussions about new building projects re the training ground, stadium etc. Although there is plenty more time taken up by chatting with the board, there are significant positives concerning throwing your weight around. For example, you now have more say on your team’s relationships with parent and feeder clubs. What’s more, have you ever found that perfect big-name player who can make the difference, then realised in horror that your wage/transfer budget cannot go that far? We’ve all been there. You might be spared that horrible moment. You can interact with the board to try and persuade them to provide extra budget to cover the signing. If it’s a marquee name, the board are more likely to go a little further and cover the deal that could make all the difference. FM17 also sees a wider range in the types of owners and how they invest, including sugar daddies and an underwriter who expects return – clearing the debts of a lower-league club – with loans recovered in the future success of the club. Very meta: Abigail Grandison, a virtual supporter on a virtual reality game, expresses her desire to get back to playing the very same game in which she has been placed. Very meta indeed. So you’ve had some good early discussions with the board to try and establish a good relationship, but what else could help make or break that bond? Well, in FM17 one new addition on this front is social media. Whereas previously you would get the occasional inbox message from a fans spokesperson saying the supporters were particularly happy or unhappy with a certain decision, now reaction is much more frequent. Not only is there reaction to the big stories but, as in real life, major news stories break, transfer rumours start and particularly good goals are linked to, making FM17 all the more immersive. As in the real world, some of the transfer rumours are red herrings. The social media section has clear areas for potential expansion in future games to increase its influence. However, the very fact it’s now included does help the game to continue to keep up with the ever-changing and technology-dominated world in which we live. The next logical step is to look at the first-team squad that you’ve been handed. Almost instinctively you will seek to get important current players to sign new contracts, and also secure new players. However this process is now more difficult than ever, mirroring real life. 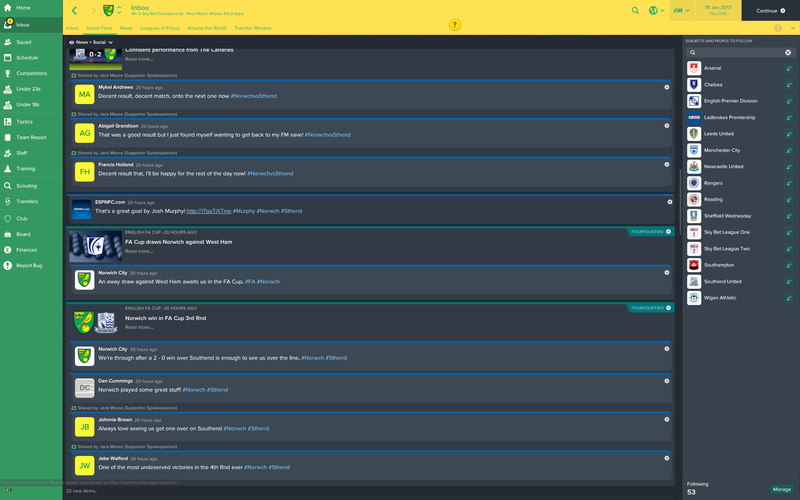 There are now pre-contract chats where you can promise players thing like the captaincy, being played in their best position, allowing your club to be a stepping stone to specific future club success to convince them to stay – though you must stick to these. Otherwise you’ll have a player wanting to leave on your hands (thankfully I have no screenshots to show this bit… yet). Once you get to the contract negotiations themselves it again becomes clear that players and agents have the player, and by George do they know it. They are more than happy to call your bluff and hold out for a better deal, with agents going between clubs. Even after reaching an agreement with you, it can take what feels like an eternity – weeks often – to finally sign on the dotted line. Naturally this process is similar to when signing players, except in that situation you’ll have the player’s club taking their time often to find the best deal too. One tip is to check the agents profile regarding their behaviour to get an idea of how they like to go about things, and customise your approach accordingly. In regards to signings players obviously this process is similar, except you need to negotiate with the clubs themselves first too. Transfer sagas play out across entire transfer windows, detailed on a brand new dedicated transfer panel, and clubs can now ask to delay a transfer until they’ve signed a suitable replacement. Finally another addition within this sphere is that managers can be transferred as well and you can build positive or negative relationships with agents over time. Meanwhile, players can use exclusive press interviews to turn the press against you. Fancy seeing Rotherham and Norwich warm-up? Of course you do. Once you’ve joined a club, audited your squad and signed some players you’re going to start playing a game or two, and the match engines have been changed. Though there is still the old school 2D players for the retro lovers among you, the 3D version has been given some new little touch-ups. These include a pre-match walk-out scene, warm-ups, use of vanishing spray, dynamic LED hoardings at big grounds. Finally, there’s a new camera angle in the 3D version called behind goal low. It’s quickly become a favourite of mine through allowing you to see the trajectory of the ball, making you feel less distanced from the action.